Although I’ve never owned a fully plastic ukulele before I’ve played my fair share that were partially plastic and generally I’ve liked them. I like the way the plastic projects the sound and the booming tone that you get. The outdoor tenor costs $145 and is constructed from 2 injection moulded pieces of composite polycarbonate plastic. It comes with Grover tuners and Rye Rabbit fluorocarbon light gauge strings. Barring the tuners everything here is plastic: bridge, saddle, nut – it’s not a ukulele that you’ll be tinkering with too much (if at all). The first thing that struck me about this ukulele was the setup. It’s the best setup ukulele I’ve ever played – the action and intonation are bang on. It just feels good in the hands and it’s really nice to play. On this point, it’s important to know that various things have been improved on the tenor model over the previously released soprano – the neck receiving the most attention and for me it’s great to know that Outdoor are listening to their audience. Although I’m a bit of a traditionalist when it comes to ukuleles, I have no problem with plastic efforts, they serve a purpose that most players could benefit from. I don’t mind the way the outdoor ukulele looks but its never going to compete with a beautiful piece of wood. The Outdoor tenor comes in brown, green or gold – as you can tell from the photos, I went for the brown. In the hands the polycarbonate feels pretty good, there’s a texture to it that stops your hands slipping around when playing and it’s got a nice weight to it too. The construction of this ukulele is really good, you can see a lot of thought and attention has gone into the design. I really like the neck on the Outdoor – for the main part it’s rounded but it has a flat area on the back too. I find it really comfortable to play and it’s a significant improvement from the square neck that featured on the Outdoor soprano. One thing I always like in a ukulele is the ability to be able to take a knock or two. I have 2 rough and tumble sons and I’ve lost count of the times I’ve heard the sound of a ukulele being knocked over. The outdoor is probably as solid as you’ll get on that front. I had a few reservations about the hollow neck before it arrived in terms of how rigid or it may or may not be but I’ve not seen anything to concern me in the time that I’ve owned it. It’s definitely got its own sound. It’s kind of clicky – sound is always difficult to describe but it’s quite punchy. There’s a very strong percussive nature to it and try as I might to determine why, I haven’t quite worked it out yet. Much like all the plastic ukuleles that I’ve played so far, the sound has surprised me. It’s clearly different to that of a wooden ukulele but it isn’t a bad sound by any stretch. I’ve heard a few players do some nice things with fingerpicking on the Outdoor but for me it’s a ukulele that is better when strummed. I’m a little but unsure on the strings and how much of an impact they’re having. As I’ve mentioned before I’m an Aquila man normally but I’m open to others too. The Rye Rabbits are better than I expected them to be but the sound seems to fall away a little – again I’m not 100% sure if this is down to the strings or not. It will be interesting to hear the difference when I throw different set on it. I’ll update this review when I’ve done that. UPDATE: The eagle eyed among you will see that my Rye Rabbit A string has split – and wouldn’t you know it happened just before I started taking the photos. This is a little bit annoying as it means I can’t add any audio files or make a video until get some new tenor strings. What I will say is, I’m not putting this split down to any issue with the Ry Rabbit strings, I think the string got a nick in it at some point. For me the Outdoor Tenor is a pretty good ukulele that occupies a slightly unusual position. 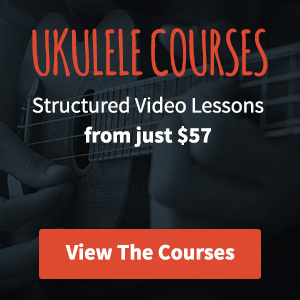 There’s not a huge amount of choice when it comes to plastic tenor ukuleles but it’s the most expensive that I’ve seen – all in all it does a pretty good job across the board. If you’re in the market for a tenor ukulele that can take a bit of a beating and you’re planning on taking it with you on a few trips then I’d say go for it. 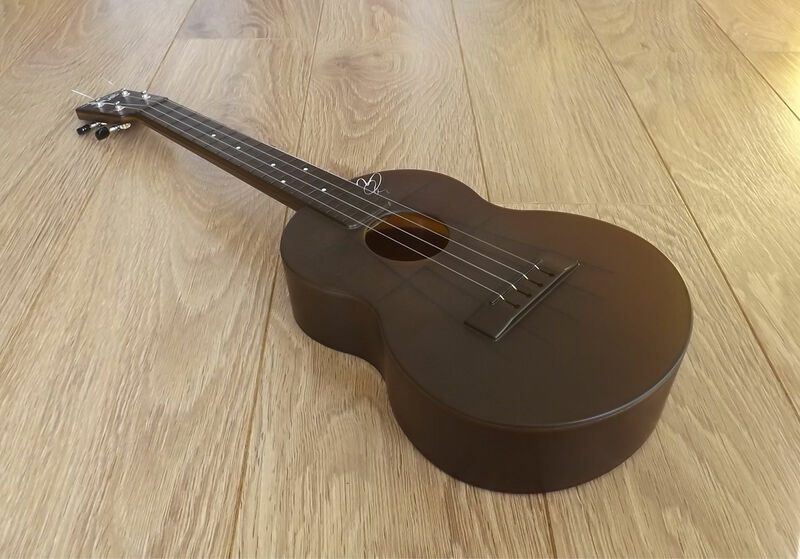 One final thing, at the time of writing I don’t think Outdoor Ukulele currently have a distributor in the UK so you’ll be hit with a fairly considerable import duty (around £30) if you order one direct. Be warned. My advice to the makers of the Outdoor is to get a UK distributor sorted fairly sharpish if they’re interest in the UK as a market. I completely agree with this review. I have the exact same model. I added the two strap buttons, which are a great inexpensive add-on, and I also added the K&K pickup (which I’m probably not going to use honestly). This is a solid good uke. Thanks for the comment Tom. I like the Outdoor, really I couldn’t fault it – the only issue I have is with the price which becomes a bit more expensive if you’re in the UK. It’s a shame the string broke but it gives me chance to try something else out! Been seeing these pop up. I would be wicked to have a uke to take in the ocean/on the canoe without worry. You say it’s well set up. Is the saddle adjustable? Looks like it’s one piece. And does it look like the nut would need a file for a low-g? Gotta get my hands on one! Hi Brad, you’re right the saddle and bridge aren’t adjustable. To be honest it plays really well so I doubt you’d need to. 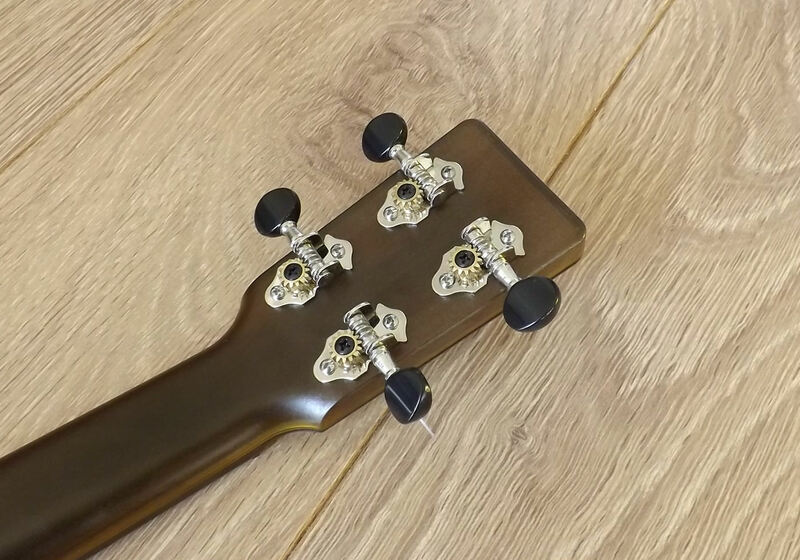 Regarding the nut, there shouldn’t be an issue – Outdoor actually sell low G strings on their site. Hope that helps! Are these available in the UK please? If so where? As far as I know the only place you can buy an Outdoor ukulele is direct from their website. This means if you’re in the UK like I am you’ll have to pay import duty (that’s what I had to do). Hope that helps. I have mentioned to Outdoor that they might want to look into a UK distributor but I never heard anything back. Great review. This is Scott from Outdoor Ukulele. We are a small family owned and operated company in the US, so our production is limited. We’re currently focused on custom builds direct through our site, but hope to open more dealers soon. Concerning the price. 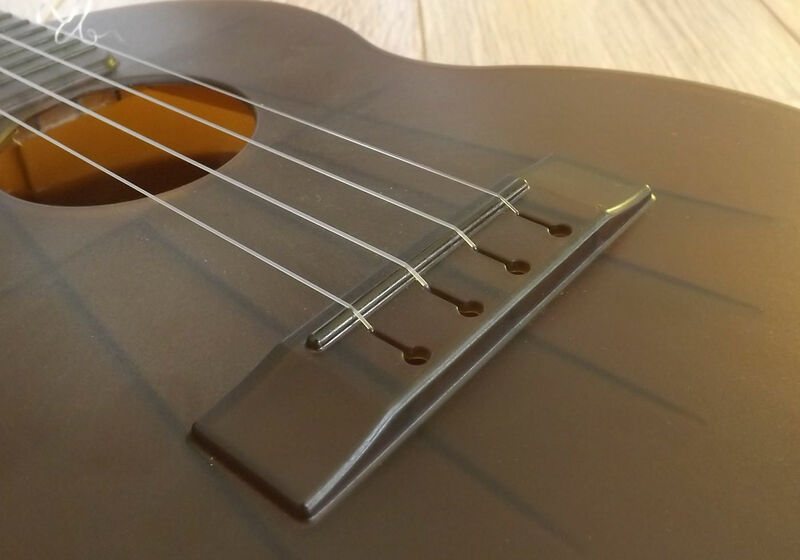 The other plastic ukuleles on the market are made from Polyethylene or ABS, which have low physical and temperature ranges. Our Composite Polycarbonate is a high performance class of resins that cost 5 times as much with very high physical and temperature ranges, and the properties for brilliant acoustics. I believe you have the Flourocarbon strings that had a softer outer coating that have been known to shred. We are now using a solid Flourocarbon string, and I will send you a new set. 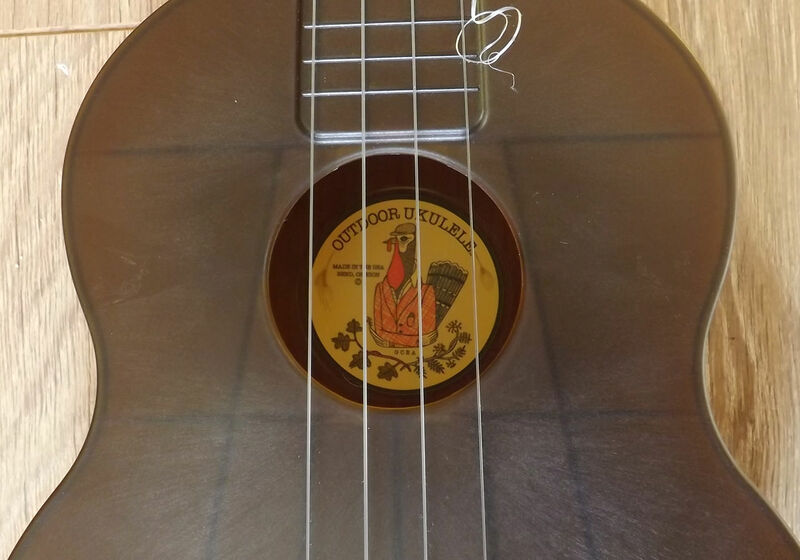 Hi Scott, thanks for giving some more information about the production of the Outdoor Ukulele – I’m going to integrate this into the review and reshoot the pics (I have some more strings now). Hi Dave. I have this same model. It is a solid, very well made ukulele. I found your comments about the “clicky sound” very interesting. I hear a constant “chicka chicka chicka” sound on the up stroke. I played it with the Rye Rabbit strings for a few days, then swapped them out with a Aquila Super Nylgut Low G set. Same chicka chicka sound, just not nearly as bright now. I’m an intermediate player at best, but none of my other 18 ukes make that particular sound. I’ll try some more strings, but this just be my “go to” uke for Johnny Cash songs….. and outdoor activities. I really do like this ukulele. Hopefully I can sort that sound out. Hi Marc, thanks for stopping by and leaving a comment. I’ve kind of grown to like the clicky sound but I cannot for the life of me work out what’s causing it. For me it’s not really an issue, its distinctive. Every time I pick this uke up it surprises me how nice it is to play. If you have changed strings, I’d love to hear your opinion of the Rye Rabbit strings vs Aquila Nylagut or the Supernylagut. I prefer a more mellow sound, myself, so I’m tempted to go with the add-on of the Supernylagut, but would love to hear from someone who has already swapped. I’m thinking of this for bringing to class (I teach high school English) so I can practice a bit during lunch and not worry if a kid wants to try it as opposed to bringing one of my two (I have a tenor fluke I LOVE and a baritone with Southcoast LowG Tenor (and tuned that way) strings and would not think of leaving either one of them at school or bringing one or the other every day, or even, so far, once. Although I did change the split string, I actually changed it for another Rye Rabbit. If you’re looking for a mellow sound then I would suspect that the Rye Rabbit’s are the better choice. Aquila’s to me are generally pretty punchy and give a fair bit of kick. That said, I haven’t tried them on the Outdoor yet. The Outdoor is pretty indestructible so if you are bringing it to class then I think it should stand up to anything that might come it’s way. They are developing an Outdoor Baritone Ukulele and are entertaining the idea of a Outdoor Parlour Guitar! Looking into this ukulele, I found your review and was surprised to hear you fingerpick what sounded to me like Jean-Michele Jarre’s Oxygene. Am I wrong, or did he steal some other melody? I’d be curious about the tabs for this. Cheers! Hey Kevin, you’re right I was playing Oxgene Part IV by Jean-Michele Jarre. I got the tab for this one from Ukulele Hunt. When the baritone outdoor ukulele comes out I’m assuming it would have bigger string spacing than the tenor? I’m a guitar finger style player. I’m most comfortable with a 1 3/4″- 1 7/8″nut. Occasionally I can find a 2XL glove to fit my big fingers. Hey Jim, I haven’t actually heard anything about a baritone outdoor other than Johnathan’s comment on this post. I purchased a tenor Blackbird ukulele for my 6 year old daughter and I to learn to play on before hearing about Outdoor Yukulele. Is there a big difference in the ease of playablity? Prefer to have her walking around outside with the Outdoor Yukulele. Also is the tenor too large for 6 year old size fingers? Hi Jim, I think the Outdoor is really easy to play. The low action counts for a lot. That said, you bought a Blackbird for your 6 year old? Am I thinking of the same Blackbird? The ones that are into the thousands? In terms of the tenor for size, you will probably have a better idea than I do as you already have a tenor. I have a 5 year old son at home and he has my genetics (I’m 5’8″) but I get the feeling a tenor might be a touch too big for him. Wondering about the kickstart Populele. 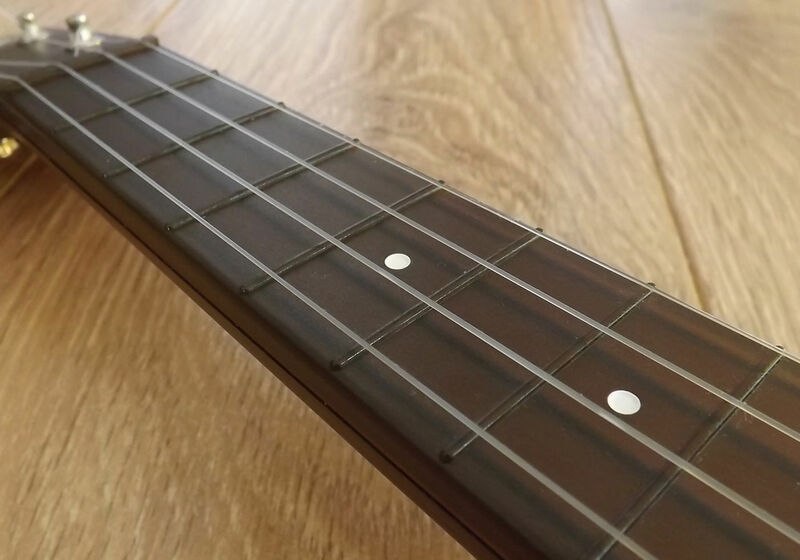 72-LED smart fretboard? No two instruments are alike. I had a Yamaha Ez-ag that through repetition taught me how to play chords. Buttons on the fret board. Prior to that I purchased the original Fretlight acoustic guitar. The Fretlight had very high strings and 1 11/16 or smaller spacing. It was almost impossible to play even after I was good enough to play in a band. 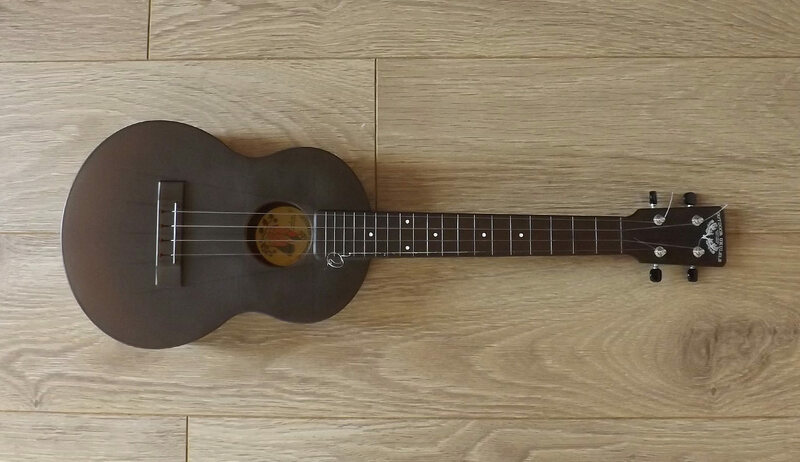 Just would like to know if the Populele is viable and as easy to play as the outdoor ukulele which is very comparable in price but a totally different critter.